Its been a while since I have had chance to knock a few pallets to bits, over the last few weeks I have had a spare hour here and there so decided it was time to get my hammer out. And Mrs Al was wanting a new garden table so I have saved myself a few quid too. A couple of years ago I was gien a load of wood to burn and those legs were amongst it. I knew they would come in handy one day. Re: My latest pallet project. 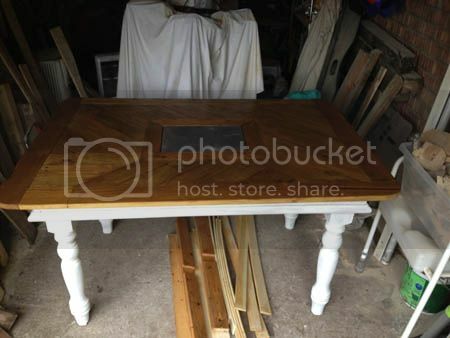 Great job there Al , is that a piece of slate in the center of the table?, and is the wood waxed/polished or varnished?. That looks really good, Al. I bet Mrs Al really likes it. Wow Al... that looks fabulous! You've made a good job of that Al. Do you not find working in a haunted workshop at all scarey? Thankyou all for the kind words. It was nice to get some wood working tools out again. At work its nearly all metal and fiberglass which is fun but it can get a bit tedious. silverback wrote: Great job there Al , is that a piece of slate in the center of the table?, and is the wood waxed/polished or varnished?. Yes SB thats slate in the middle, it will be handy for the hot roasting tins etc when they come out of the wood fired oven. I varnished this table top as I think its a bit more durable than a waxed finish. One of your fb DTL admins with Manda Powdrill and Christy Poole. I could do Gwen but I have one day off a week so its a bit valuable. Looks really good Al, how long did it take? Totally Scrambled wrote: Do you not find working in a haunted workshop at all scarey? My hubby hates pallets, however in my new job I have unlimited access. Last month I took 2 to my dads house, 2 days later we collected the " spare wood " dad had, and hubby made a spare run with it.